How can this be true? Raising chicks is hard; it takes energy and time and risk. Why would any bird make those sacrifices for an unrelated chick? Okay, I would absolutely adopt this guy. We can be pretty sure that adoption isn’t due to the birds having the same sort of “aww I love you cutie” reaction that we humans get when we look at baby birds, because birds attack and kill each other’s chicks all the time. 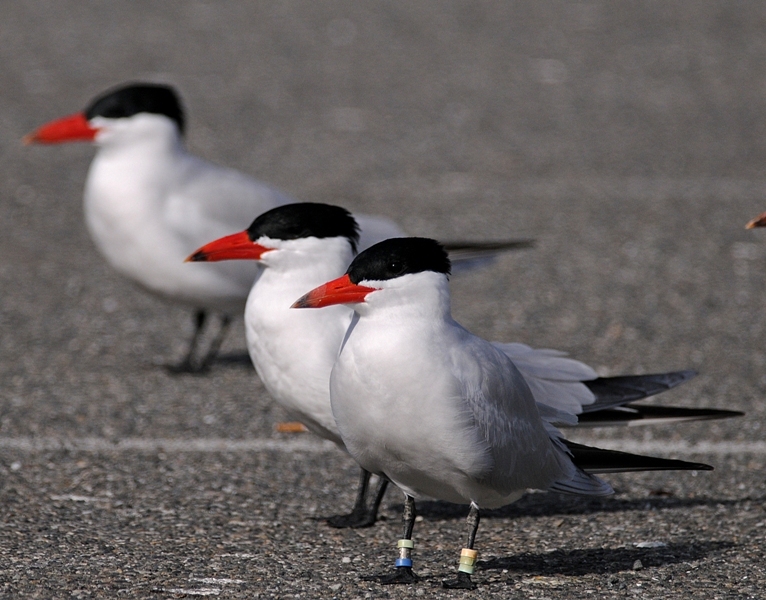 Birds whose nesting sites are scarce will kill chicks in the hopes of stealing the nesting site from the parents. (I’ve seen this first-hand in House Wrens. Those guys are scary.) 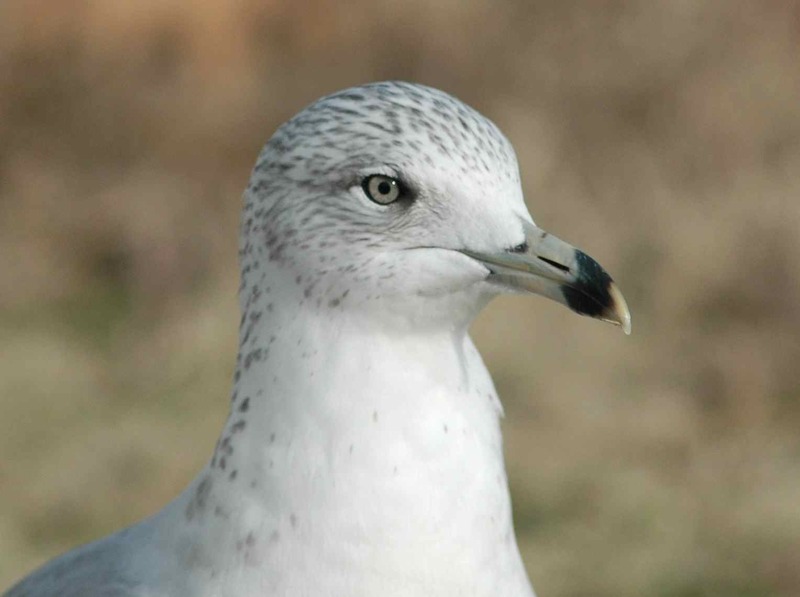 Colony-nesting birds like gulls will kill and eat chicks that accidentally wander away from their parents—except sometimes they adopt them instead. Why? From Kill you to Feed and protect you is a pretty big jump to make! So far it looks like the answer to the adoption puzzle is: it depends. Different birds adopt for different reasons. In many cases it may just be a mistake, where parents fail to see that the fuzzball that just wandered into their territory isn’t the same fuzzball they’ve been feeding, and that in fact they started out with three fuzzballs and now there are four, which is a different number. 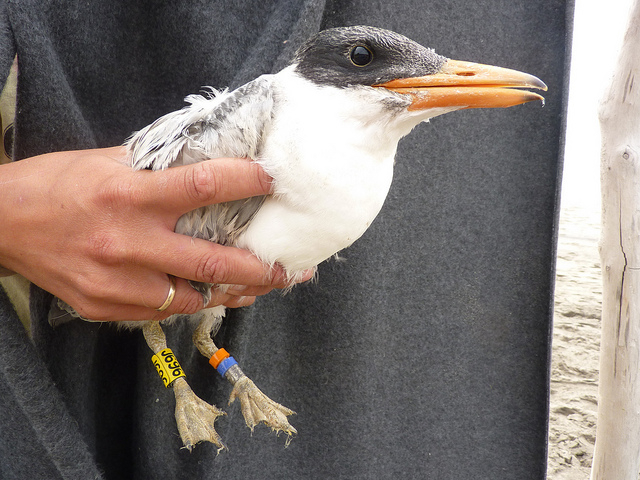 It may even be that the parents do recognize that the number has changed, but lacking any way to tell the newcomer from their own chicks, they opt to care for all of them. Adoption happens less frequently as chicks get older, possibly because parents learn to tell their own chicks apart after a while. 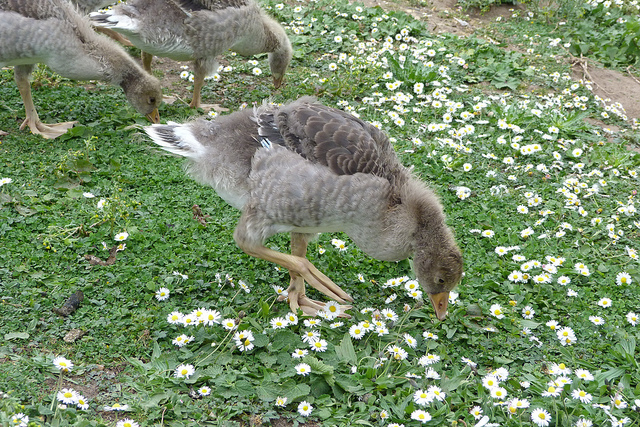 …over these older Greylag Goose chicks. In some cases there may be a benefit to parents in adopting. 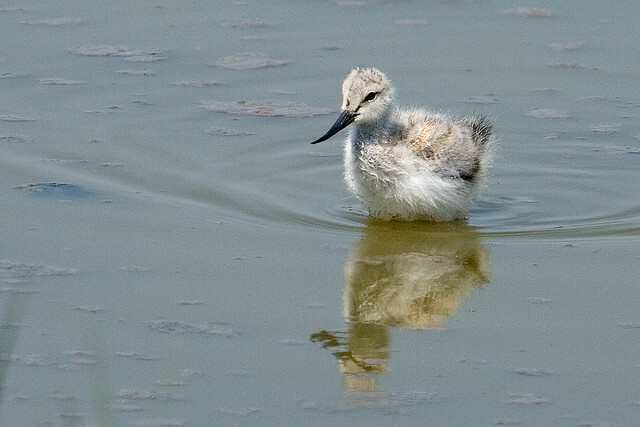 Many species of birds that adopt are nidifugous: that is, the chicks are mobile and feeding themselves soon after hatching (think ducks, geese, shorebirds). In these species the parents don’t feed the chicks, they just lead them to food and protect them. One extra chick doesn’t cost the parents much—it’s not an extra beak to feed—but it does increase the number of little eyes watching for predators, and decrease the chances that if a predator strikes, he gets one of their chicks. 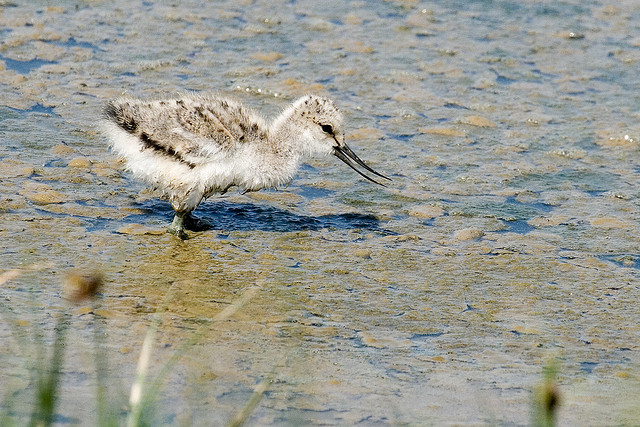 Many of these species also “creche,” pooling several broods of chicks together and caring for them jointly, possibly for exactly these big-brood benefits. From the chick’s perspective, adoption is usually accidental. When everyone is running around and a lot bigger than you are, sometimes it’s hard to keep track of where Mom is, or which one Mom is. 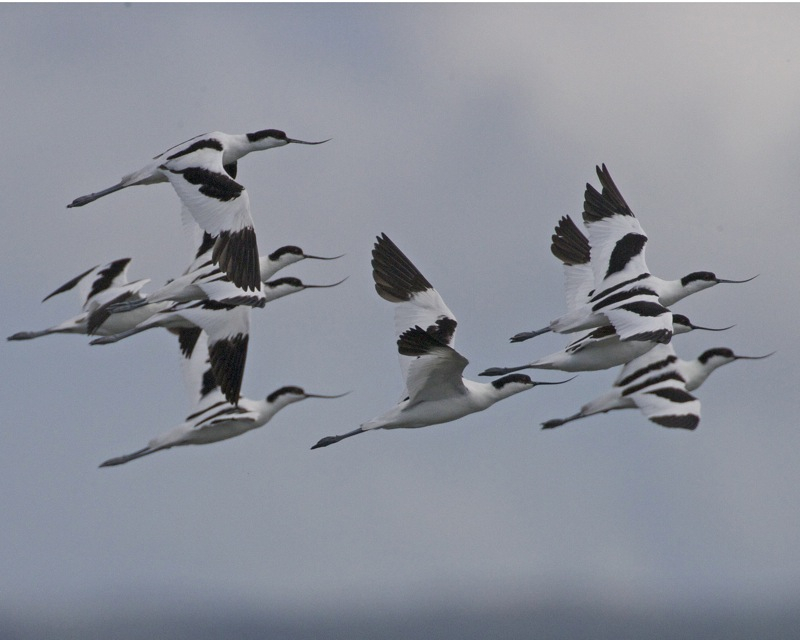 In Pied Avocets, the eggs often hatch over two days or more, meaning that some chicks are running around and feeding while others are just hatching. Sometimes the oldest chick will run off to feed with a different group of chicks, and when that group leaves, the chick goes with them. Other times, the parents leave the nest before the youngest chick is ready, and that chick ends up insinuating itself into another group. 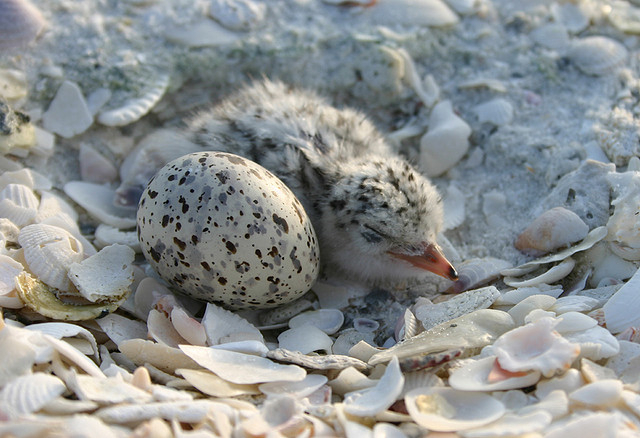 Often adoption is the only way for an abandoned or orphaned chick to have a shot at survival. But even when you’re a lone gosling in need of a family, you can make the best of a bad situation. Komdeur et al. 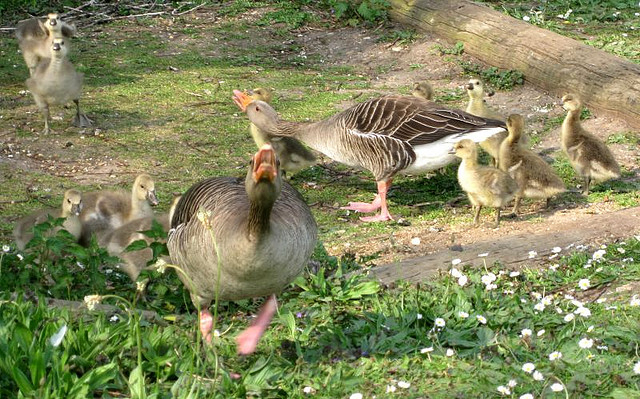 (2005) found that lone Greylag Goose chicks given a choice between foster families always chose dominant families over subordinate ones, raising the interesting possibility that chicks might “shop around” among possible foster families. What about species where adopting doesn’t help the parents’ other chicks stay alive but does mean that the parents have another chick to feed? In many cases these adoptions seem to be “errors” where the parents are biologically primed to breed, with reproductive hormones circulating, and they see a chick and do what their hormones say is right. 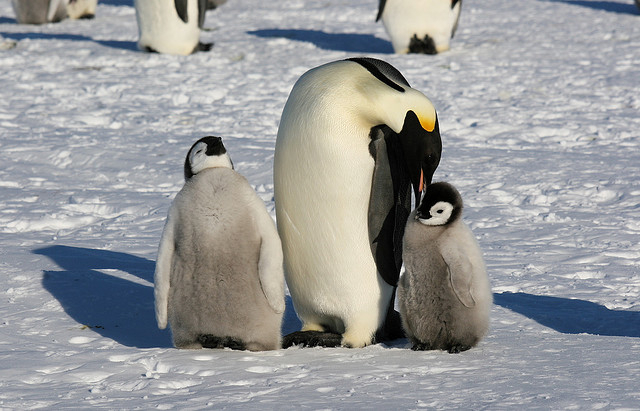 Emperor Penguins without chicks of their own will even kidnap very young chicks—although for reasons that aren’t clear, they often abandon the chicks soon after. If the chicks are lucky their parents hear their calls and take them back. Emperor Penguins. These chicks are old enough that they don’t have to worry about kidnapping anymore. They’re all grey spotted fluff, basically. Of course they start to look less similar as they grow up. Strangest of all are the instances where I will eat you turned into Let me raise and care for you in the same bird. 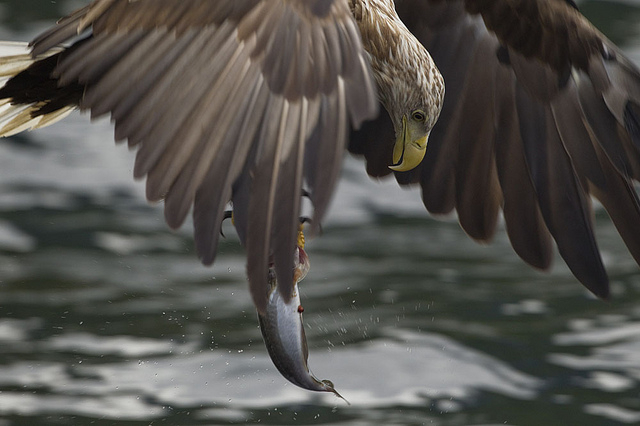 Literak & Mraz (2011) found several nests of White-tailed Sea Eagles that contained both young eagle chicks and Common Buzzard chicks, all of which survived and fledged. Young buzzard chicks can’t fly, and the eagle nests are high off the ground, so how could the buzzard chicks have gotten there? The researchers considered several possibilities and determined that the most likely explanation for the presence of the buzzards is that the eagles caught them and brought them to the nest intending to eat them—but then raised them instead. This has also happened with Bald Eagles adopting and raising Red-tailed Hawk chicks that they had intended to eat. Even fledglings get adopted sometimes, although you would think that by that age, the parents would have figured out which chick was theirs. 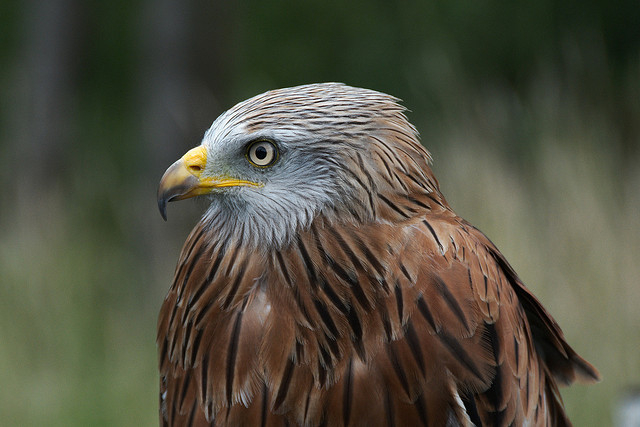 In Black Kites and Red Kites, fledglings will visit other nests to pirate food—and sometimes just don’t leave, and are adopted. It’s not clear why the parents permit this or why the fledglings switch families. Bustamante J, Hiraldo F. 1988. 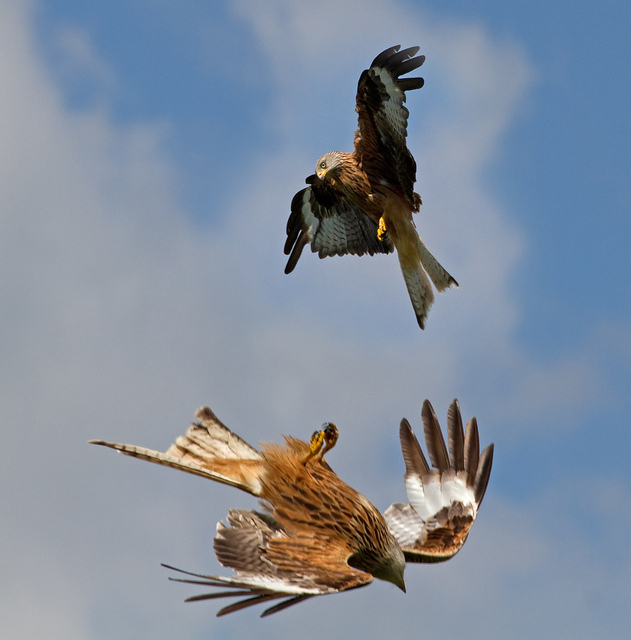 Adoptions of fledglings by Black and Red Kites. Animal Behaviour 39(4):804-806. Jouventin P. 1995. Adoption in the emperor penguin, Aptenodytes forsteri. Animal Behaviour 50:1023-1029. Komdeur J, et al. 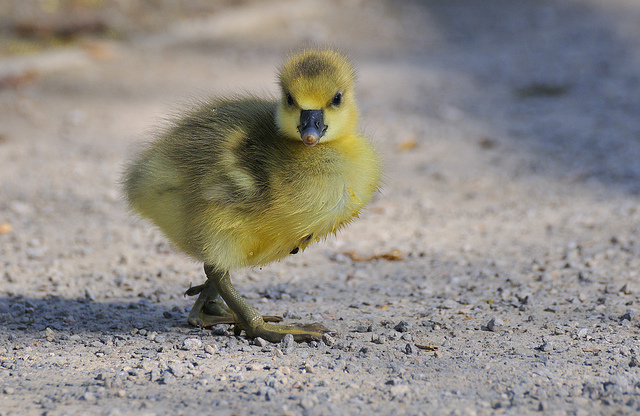 Adoption as a gosling strategy to obtain better parental care? 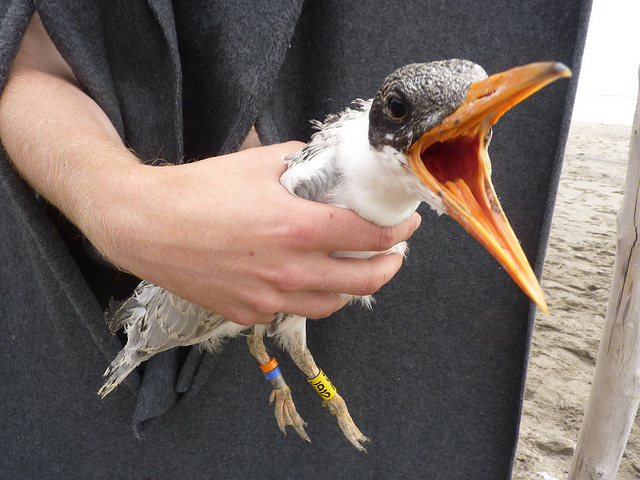 Experimental evidence for gosling choice and age-dependency of adoption in greylag geese. Behaviour 142(11):1515-1533. Literak I, Mraz J. 2011. 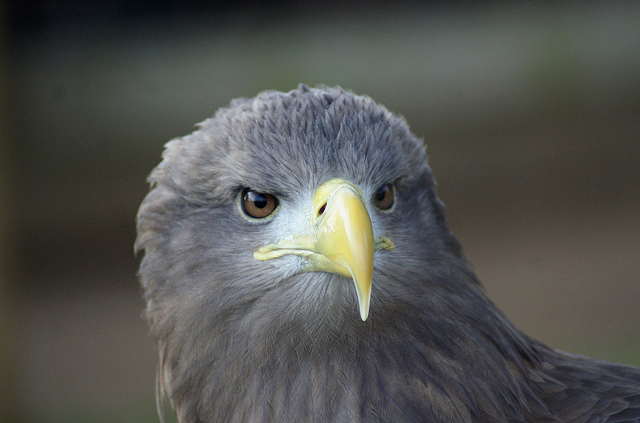 Adoptions of young Common Buzzards in White-tailed Sea Eagle nests. The Wilson Journal of Ornithology 123(1):174-176. Oswald S, et al. 2013. 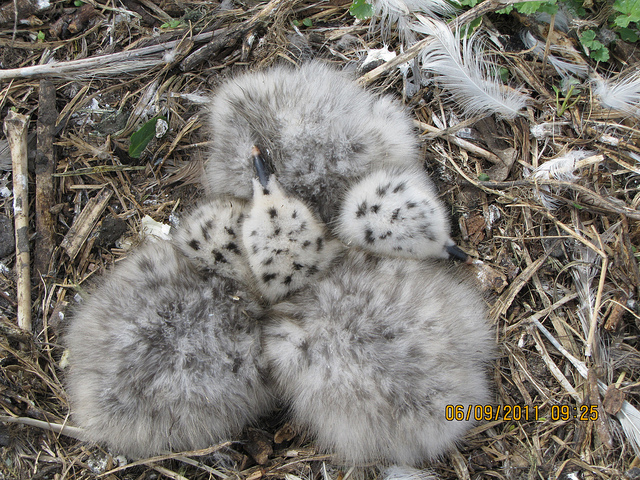 Caspian Terns (Hydroprogne caspia) fledge a Ring-billed Gull (Larus delawarensis) chick: successful waterbird adoption across taxonomic families. Waterbirds 36(3):385-389. Photos credited to other people were all accessed through Flickr and are under a Creative Commons Use license to their respective authors. This entry was posted in general science-y stuff, other people's research and tagged adoption, animal behavior, biology, birds, chicks, parental care, science by toughlittlebirds. Bookmark the permalink. This is awesome, I had no idea any of this happens!! 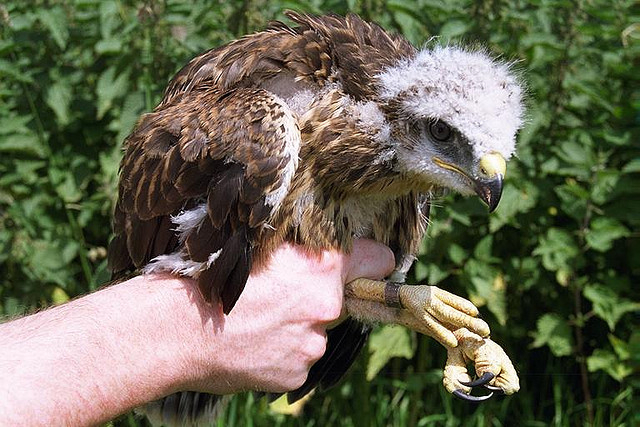 And those fledgelings are so derpy it’s hilarious (lookin at you, common buzzard chick…) Thanks for this post, great read! There’s just something especially funny about young raptors, isn’t there? Something about how they’ve got awesome weapons on both ends but just look kind of scraggly-droopy and confused. That was fun learning about the different scenarios. Well told. Love the humor and curiosity in this post. Also, the photos are great. 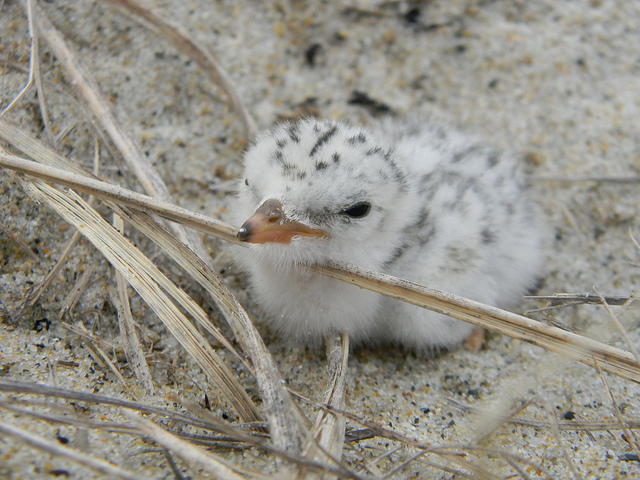 I just adore the young least tern chick and egg. Thanks so much! And yes I like that photo too – it’s neat how much the chick matches the egg. Interesting to learn about more adoption scenarios other than brood parasitism. In Young Audubon: Boy Naturalist there are a couple chapters that talk about the Cuckoo and how it always lays eggs in the nests of other species. Came across your post today, as I discovered my own bird adoption today! I was near an open window and could hear a fledgling squawking and walking around. I looked out, and saw a tiny adult bird half the fledgling’s size bob up to it and feed it. They pecked around some more, and the tiny bird kept feeding it. Not sure how the two found each other, but it was amazing to witness. How funny! You’ve probably found a Brown-headed Cowbird nestling with his foster parent; cowbird fledglings are often comically larger than their foster parents. (A google image search will get you some good pictures.) Cowbirds lay their eggs in the nests of other species when the other birds aren’t looking, and then the other species raises the cowbird without realizing that it isn’t their own baby. Thank you the information. I have been watching a male sparrow feeding a much larger Wren at our feeder. I had never seen that in all my years of bird watching. Very interesting! Its funny how there like I WILL EAT YOU to I WILL LOVE YOU! Anyone else find that funny?